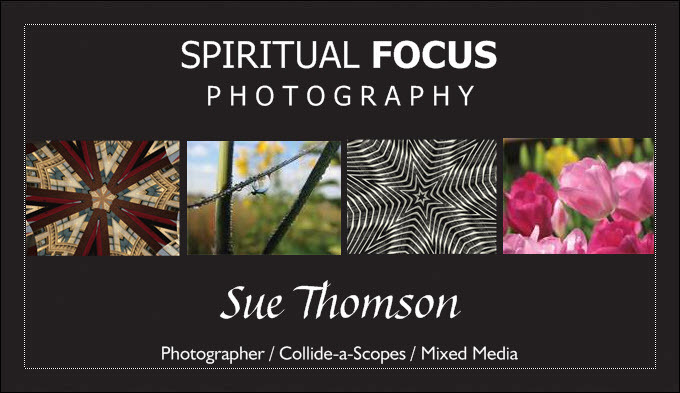 My company, Spiritual Focus Photography, derived its name because I wear several different hats. Spiritual – I have been on staff as a Contemporary Worship Leader/ Minister of Worship for 14 years. I know that God is present in my life and He is with me everywhere I go! I have been very fortunate to see Him working around me and through me at two very distinct times in my life… although there are so many other times, as well. I wish that everyone would experience the love and beauty that I experience through Jesus Christ, which is probably why I share my thoughts and experiences with all of you! Photography – I have been a “professional” Photographic Artist for the last 4 years after receiving encouragement from those around me. I love to photograph nature and various types of architecture, but I also love to take my own original photos and I manipulate them into Collide-a-Scope art pieces! I also print onto paint skins, dryer sheets, metal, textured papers, and fabrics! Lately, I also began working with layering and collage with my photographic art pieces! I am going to mix up my blog between the spiritual and the artistic world and I hope you will enjoy and find meaning in them both! I am very aware that all my talents, be it artistic, musical, or in leadership, are all God-given and that I am truly blessed with friends and family. When I surrender to God’s will, He has taken me to places I would have never imagined… from being in a rock band, a Christian rock band, writing music, leading worship, and becoming a photographic artist. It is all God! Through the things I continue to learn, as well as the things I do, my ultimate goal in life is to help others take time to step away from the everyday hustle and bustle. It is important to find quiet, so we may more carefully and thoughtfully look at the world around us. If we can stop rushing around and find some quiet in our lives, we will more clearly see God’s beauty, as well as the things and people that he calls us to care for. I think that being a worship leader and writing church services is at the center of affording me that quiet time to hear Him speak and for that I am grateful. Seeing Him at work is my greatest joy! My other goal is to help us find better ways to move away from our self-centeredness and to search for better ways to love one another. That is how we will begin to truly bring peaceful solutions to a troubled world. This entry was posted on February 21, 2015 by Spiritual Focus Photography in OUR SPIRITUAL JOURNEY, Photographic Eye - Photos and Art Pieces and tagged art, artistic, beauty, blessings, Christ, Christian, collage, experiences, faith, faith journey, Focus, gifts, God, God's beauty, help others, Jesus, Jesus Christ, joy, life, LIsten, love, love on another, music, nature, peace, Photographer Sue Thomson, photography, quiet, reflect, self-centered, spiritual, Spiritual Focus, Spiritual Focus Photography, spiritual journey, Sue Thomson, Sue Thomson Arlington Heights, Sue Thomson Photography, surrender, Susan Thomson, troubled world.